Summer break is right around the corner, and many are already planning a family vacation. For some, this means loading up the car and heading on a road trip. While a road trip can be exciting, it is important to remember that relying on the family car to arrive safely to your destination doesn’t always go according to plan. Before setting off, be sure to follow our tips on how to plan a road trip safely. While jumping in the car and going where the road takes you is a tempting and romantic notion, having at least a rough plan of where your destination is and how to get there is the first step to planning a safe road trip. 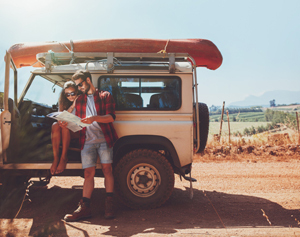 When planning a road trip, be sure to allow time for extra stops, as well as mapping alternate routes in case of road closures or traffic delays. Print out a map and directions, in case your phone or GPS loses power or its signal. Identify possible trouble spots and toll roads on your route. Download one of the free traffic apps on your device and monitor areas along your route a few weeks before your planned trip to get an idea of traffic patterns. Look up the local state driving laws along your route. You may need to invest in hands-free navigation in order to avoid tickets and fines. Just as runners prepare their bodies well in advance of a marathon, so should you prepare your car for a road trip. It is best to have your vehicle serviced shortly before your trip. In addition, it is also a great idea to clean your vehicle inside and out, to make room for your luggage as well as easing the effort to find important items along the way. Consider enrolling in a roadside assistance service. Be sure that your insurance card, registration and other vital documents are up to date and placed in an easy-to-find area of your car. Purchase a prepaid phone card in case your cellular service loses coverage in an unfamiliar area. If you aren’t an organizational guru, this may be the least enjoyable aspect of planning a road trip. However, most of the items you need to pack should already be in your car, if you followed our advice in our previous post regarding a car emergency kit. While you can probably skip the snow shovel and kitty litter on a summer road trip, you should still pack a blanket and nonperishable foods. Along with the usual emergency items, you should also bring a set of spare car keys and a pair of sunglasses. The last thing you need is to lock your keys inside your vehicle in an unfamiliar location, miles from home, and sunglasses can help you avoid accidents due to the blinding sun. Have water in an easy-to-reach location during your trip. How you pack is as important as what to pack: pack emergency items last or in an area that is easy to access, so they are readily available when needed. Avoid securing items on the roof of your vehicle. If an item becomes loose during the trip, it can cause an accident. Even stopping along the road periodically to check and secure loose items is dangerous, as fatal accidents have occurred due to other drivers’ inattention of the road. Add extra motor oil and coolant to your car emergency kit.